by Leroy Moore from Krip-Hop Nation:Krip-Hop Nation: This is the first time Krip-Hop Nation has had a chance to talk about a play on Down syndrome starring an all-Black cast. Tell us why do you think people need to see “Then You Stand”? Yvonne Pierre: First, thank you for taking the time and interest to interview me about “Then You Stand.” I personally believe everyone will take something different away from this production whether they have a child with special needs or not. What I hope people walk away with is the feeling that no matter what they face in life, they can and will rise above it. There’s always a bigger plan and in the midst of that we must stand. My youngest of two sons was diagnosed with Down syndrome. I’ve been advocating through projects for over seven years. Although it’s an all-Black cast, this is a production that anyone will be able to relate to. KHN: This is your first play. Tell us how you got into this field and will you do other plays in the future? Yvonne Pierre: Several years ago, I met a woman named Glenifer Wade during a time when I was working on a documentary. Prior to meeting her, I studied script writing for several years. She had a local TV show called “Extraordinary People” here in Atlanta, Georgia. We became very close friends and would work on each other’s projects. She was very passionate about her show, as well as poetry and stage plays. During that time, my passion and focus was on developing films and books. This was around 2006, and I was in the process of working on a production that included dance, singing and speakers on the topic of Down syndrome. I began to work with her on a stage play and helped her develop a working script. She was impressed with my work and encouraged me to do my own play after we finished hers. As I began to help her produce and direct her production, the bug bit me. In March of 2011, while we were preparing to produce her play, Glenifer passed away. Several months after her death, the inspiration to do “Then You Stand” came to me and I immediately began to develop this vision and put it into motion. I loved it. Will I do more in the future? Although I don’t have anything planned right now, I absolutely plan to do more productions in the future. What I hope people walk away with is the feeling that no matter what they face in life, they can and will rise above it. There’s always a bigger plan and in the midst of that we must stand. KHN: “Then You Stand” has music in between scenes. Tell us the reason why you added live music and how did it fit with the story? Yvonne Pierre: I love words, music and dance and find them to be the most powerful forms of expression. The intention was to have each performance extend the emotion of the scene. For example, in the first scene of “Then You Stand,” the main character, Mona, finds out that her unborn child has Down syndrome. The Master’s Mime then dances after the scene, performing to the Yolanda Adams song “Open My Heart.” The dance and music carries out the emotions expressed in each scene. KHN: I know you are a mother of a son who has Down syndrome; however, did you work with people with Down syndrome in creating this play. If not, have you or will you work with people with disabilities on the stage? Yvonne Pierre: The primary focus for “Then You Stand” is the parenting side of having a child with special needs. Over the years, I’ve spoken to many parents as well as read comments and posts by parents who are struggling to cope with having a child with special needs. Most of my work up until this point has been geared towards empowering parents. If a parent doesn’t believe in or has lost hope for their child or themselves, then they will not push to get the help needed for that child to reach their full potential. I believe that in order to reach the child, the parents must be empowered. The last performance of the play features a couple children with Down syndrome, including my son Zyon. They all came out on stage with candles while an original song was being performed by Ayme Loren called “Silent Angels.” After that performance, self-advocate Jennifer Katz spoke to the audience. Over the years, I’ve met so many VERY talented individuals with Down syndrome and other special needs. I will definitely work with talented individuals with disabilities in the future. Absolutely! KHN: After I watched it, I have to say it was a fresh outlook on the father character for me because you usually have a strong Black mother who holds things together and usually alone. Were you trying to make a point that some Black men deal with disability in a family unit? Yvonne Pierre: I agree, there are a lot of fathers who do walk away from their responsibility, whether the child has special needs or not. But there are men who love their children and are great fathers. Zyon’s dad is one of them. There are great fathers who are a part of their child’s life. They are not represented enough. We are always presenting women as strong, when not all women are and have a hard time holding it all together. Sometimes those who appear strong are really avoiding and not facing what’s going on. There is also a stigma, silence and shame surrounding the special needs community. Often, we don’t reach out for help or participate in support groups. I must admit that initially, I felt the same way. I thought a support group was a bunch of parents sitting around pitying themselves. When Zyon began to transition from early intervention into public school, I realized the importance of networking with other parents. If a parent doesn’t believe in or has lost hope for their child or themselves, then they will not push to get the help needed for that child to reach their full potential. I believe that in order to reach the child, the parents must be empowered. Parents of special needs children can be very resourceful. A lot of things I learned were through other parents and many of the parents I’ve met online are often advocates too. KHN: I know for me as a Black disabled man, it has been sad not to see myself in the entertainment field from plays to music in great numbers with diverse stories. Do you think your play can be one image in the mirror for Black families? Yvonne Pierre: Definitely, but I also think it can be an image for families regardless of race. The issues surrounding the disabled community cross all color lines. KHN: Would you have written a play dealing with Black disabled young men in our society? Yvonne Pierre: As I mentioned, my primary focus has been parenting. However, I will definitely consider it in the future. All sides must be told. There are so many great stories surrounding the disabled community that need to be told and presented in film, TV and plays. Particularly, I’d like to see more positive images of individuals with disabilities. If there’s a story about someone with a disability, I’d like to see more producers and casting agencies hire skilled actors with disabilities, instead of hiring actors to “act” as if they are disabled. KHN: How did you bring the ideal of “Then You Stand,” the play, to the theater community and what was their first reaction to it? Yvonne Pierre: Over the years, I’ve learned the hard way that if it’s your dream, your vision, then it’s in your hands. It’s up to you to make sure it happens. I’ve had so many doors closed in my face from other projects, some that don’t have to do with the special needs community. So, out of habit, when I came up with the idea, I didn’t consider putting it into someone else’s hands. After I wrote the play, I spent long hours and sleepless nights researching, studying and preparing to make it happen. I searched for venues that rented out their stages and booked, directed and produced it myself. KHN: I saw my mother face racism back in the ‘70s and ‘80s in advocating for my needs. What were your experiences with your son? Yvonne Pierre: I think over the years a lot has changed, BUT there’s still a long way to go. Back in the ‘70s, for example, they were encouraging parents to institutionalize their children. They didn’t have as many resources such as early intervention, therapy and programs for children with special needs. It wasn’t that long ago that the disabled were given rights to an education. There’s still a fight to get people to see that I’m not delusional or in denial when I say my son can learn. There is still a need for curriculums for teaching children with Down syndrome and other developmental disabilities within the public school system. In the healthcare system, a lot has changed as well, but there are still a lot of doctors that see Down syndrome in a negative light. 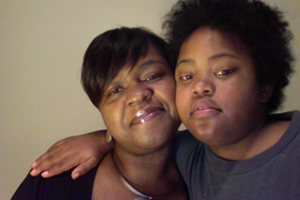 For example, when Zyon was born and the genetics doctor gave us the results that Zyon tested positive for Down syndrome, we were told that if I were to become pregnant again, DS was grounds for abortion. My mouth dropped. I was more upset that the doctor would say this about a child, a human being. I was very disturbed by the reactions. So the discrimination is still there, but I’m hopeful that it will continue to change. Thanks to the many, many AWESOME advocates – parents, loved ones, individuals with disabilities and supporters – who continue to push doors open. Over the years, I’ve learned the hard way that if it’s your dream, your vision, then it’s in your hands. It’s up to you to make sure it happens. KHN: Your play can be used as an educational tool for new parents and others. What are your plans for the play? Yvonne Pierre: The video for “Then You Stand” is available to view for free online via YouTube and on ThenYouStand.com so that parents can view it on demand. Also, I encourage people to make a donation of any size, if they can, to Down syndrome research. That information is also available in the description area of the video on YouTube. Right now, I’m focused on reaching out to as many parents as possible through social media. I also have a website, “Have Ya Heard” (www.hyhonline.com), where we feature stories of extraordinary people – parents, self-advocates, professionals, nonprofit owners and so on – sharing their experiences. These stories are inspirational and informative as well. KHN: Has your son seen the play and did he enjoy it? Yvonne Pierre: Well, actually on the day of the play, he didn’t. He was backstage the whole time with me, but he did see the final rehearsal and the video footage. He LOVES music and dance – he really enjoyed it, both my sons, Zyair, 19, and Zyon, 10. KHN: Do you think the theater and entertainment industry are ready for stories like “Then You Stand”? And how can we push the theater community, especially the Black theater community, to have more plays with a disability theme? Yvonne Pierre: When I decided to do this production, I didn’t give a second thought to if it was industry ready or not. As a parent and advocate, I felt like it was needed. I strongly believe that in order to have more productions surrounding the disabled community, we as parents, advocates and individuals with disabilities have to create it ourselves. KHN: What are your next projects and how can people stay in contact with you? Yvonne Pierre: My next project is a fictional book that I hope to release next year. This will be my second book, but first fictional work. My first book, “The Day My Soul Cried,” was released in 2010 and is about OVERCOMING some personal internal struggles from being molested, my father being murdered, my battles with reading and writing and the effect it had on me. It’s amazing how your biggest struggles can become your passion. I can be reached via Facebook.com/ypierre01, Twitter.com/ypierre or through my website YPierre.com. Thank you so much for this interview. Great questions and I truly appreciate it. Blessings! Krip-Hop Nation founder Leroy F. Moore Jr. can be reached at blackkrip@gmail.com. Call-In Day Wednesday, December 19th!